Both Magic-Users and Clerics may attempt to expand on the spells listed (as applicable by class). This is a matter of time and investment. The level of the magic required to operate the spell (determined by the referee) dicates the initial investment. Investment for 1st level is 2,000 Gold Pieces, 2nd level is 4,000 Gold Pieces, 3rd level is 8,000 Gold Pieces, 4th level is 16,000 Gold Pieces, 5th level is 32,000 Gold Pieces and 6th level is 64,000 Gold Pieces. The time required is one week per spell level. For every amount equal to the basic investment spent there is a 20% chance of success, cumulative. An investment of 10,000 Gold Pieces in order to develop new 1st level spell, for example, has a 100% chance of success after one game week. The level of the spell researched must be consistent with the level of Magic-User or Cleric involved, i.e. the character must be able to use the spells equal to or above the level of the one he desires to create. 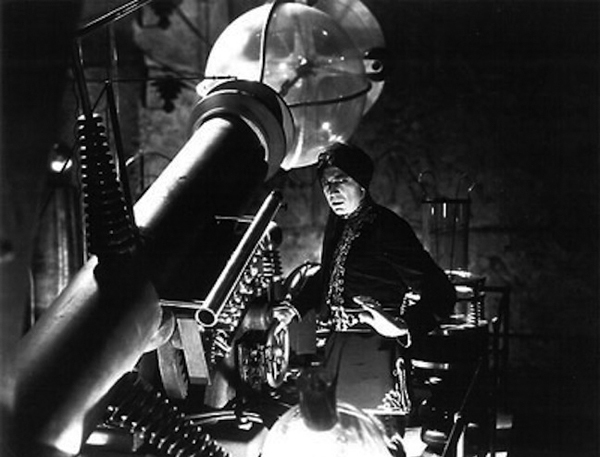 Once a new spell is created the researcher may include it in the list appropriate to its level. He may inform others of it, thus enabling them to utilize it, or he may keep it to himself. There you have it. Very good. So with a great deal of effort (ie - Gold Pieces and time) one can extend the Spells lists. Nice. I wonder, though how hard it is to accumulate that much gold in a given game? I'm really not sure how that plays out in a practical sense. Does it take one game for the average dungeoneers to accumulate 10,000 Gold Pieces, or fifty? While this of course does depend on the GM involved, one should also be able to get a sense of the value of an adventure by looking at how much Gold a given monster group is likely to have according to the monster charts in Monsters & Treasure, so I'm going to hold off on this bit of analysis for the moment. My guess is that it's not necessarily all that easy to accumulate the Gold necessary to advance the spell list, but we'll see how it looks later. What I'd be really, really curious to hear is what spells people created back in the day! That would be really interesting! Characters who employ spells are assumed to acquire books containing spells they can use, one book for each level. If a duplicate set of such books is desired the cost will be the same as the initial investment for research as listed above, i.e. 2,000, 4,000, 8,000, etc. Loss of these books will require replacement at the above expense. Hmmm... ok. So this rule is interesting but not very clear to me at this point. I know there's been a billion tons of talk about Vancian Magic and the use of spell books and requirements for Magic-Users to have their spells memorized and all of that. But at this point in the Rules I'm not clear as to how that works. I'm supposing that this will be made more clear later on, perhaps? Or should we be able to infer from this paragraph how all of that is intended to work? Well, a careful reading gives us the basic command: whatever spells the spell caster can use must be in their books. It doesn't say that the initial set of books cost anything, but only a duplicate set. One assumes that this suggests that the Magic-Users and Clerics would want to have a backup copy in case the first set gets lost (perhaps by fire, or some such). This also suggests, perhaps, that the Magic-User can't cast their spells unless they have such books, though that is not explicitly stated. Interesting. I'd be curious to hear how this played out from those who played OD&D back in the day. Or, maybe there is further clarification in somewhere in the next two books. We'll see. Ok that concludes my analysis for Book 1 of Original Dungeons & Dragons, Men & Magic. Next time I will crack open Monsters & Treasure and we'll take it from there. At my current rate of publishing this series we are about two years out in terms of completion. So hang in there, and try to stay healthy. Maybe I'll even try to go a little bit faster, possibly. It depends on how busy I am working on Elthos. Ok, so in thinking about this more and realizing that I have another problem I'm on to the next thing. The ranges for the medium and heavy weight bows. The problem being that the heavy bow, which represents (abstractly) the Longbow, has a range that is far too short for a long bow, I THINK. I'm really not sure. The reason I say that is because I was really caught by surprise that the light bow ranges turn out to be 12 to 14 yards, or around 40'. That was surprising to me. I thought in the real world the ranges would be much farther. But as it happens, when you're actually hunting, about 40' is pretty much the common range. I was thinking it must be more like 100', or more. But no. So now I'm wondering if those ranges I had for the Longbow at like 300 yards is actually way too far? It may be that 300 yards if you are shooting high in the air to get as much distance as possible, and standing with hundreds of other archers so you are collectively creating a cloud of arrows wherein no given shot has to be accurate, then 300 yards is fine. But if you are trying to hit a specific target then maybe the range at 36 yards makes sense? Naaaahhhh... I kind of doubt that. This actually works pretty well in terms of what I already had in my world. 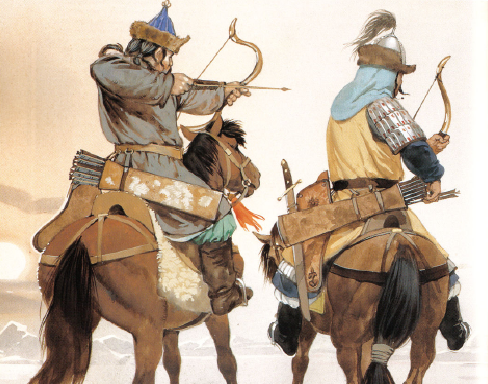 The 40lbs bow would be the equivalent of a light bow, the 80lbs would be fine as the standard bow, and the 120lbs could stand in for the long bow, though I don't know if longbows have 120lbs, but I heard in a separate video that a particular type of Turkish bow is around 120lbs, and that's pretty much the maximum, at least for natural old world style bows. So I'm going with the 120lbs as my longbow. Then they showed the penetration into gel which is what the inches on my chart represent. Inches of penetration. This I then translate into dice. My short bows can do 1d6, standard bows 2d6 and long bows 3d6. And beyond that they do bonus damage based on range, which is what I gather is the underlying point of the video. Makes sense to me, and I think it certainly adds something interesting to archery in my world. The closer you can get to an opponent before firing the better, because damage is directly related to range. Neat, and ok. So that's what this chart resolves, and I think it may be good. On the other hand I still question if I want the different bows to do different dice of damage, or should they all do 1d6 as the currently do? So keep the bonus damage per range values, but all three types of bows will do 1d6 for base damage. Hmmm... obviously adding dice really amps up their effectiveness. And remember, in Elthos RPG, which is what I'm using, Life Points = Strength * Level. In addition, it should be noted that Levels go up to 6 in the default configuration of the rules, and that's considered Paragon level. 3rd Level are Veterans, and generally considered stout warriors who can give and take some damage, especially when they're properly armored. But as you'll see, combat usually doesn't last long in Elthos. To give you an idea of the scale of stats, a 6 Strength Fighter at 6th Level has 36 Life Points. But I like to start with average cases. So lets take the case of a standard bow doing 1d6+5 at 14 yards, or 42', so average damage would be 3.5 + 5. That is on average 8.5 Life Points. Now let's say our fighter is hefty with a 5 Strength and at 3rd Level, so 15 Life Points. And lets say he has medium armor of leather and a shield absorbing 2 points of damage per blow. If I made that 2d6 instead of 1d6, the average damage would be 7 + 5, or 12 Life Points. It would take one shot to take him down if a little luck comes your way. If his armor absorbs 2 points, then the fighter would actually take 10 Life Points. But of course we also need to understand how often the fighter will be hit as well. With Leather and a Shield, that's AC +2. Damage absorption is 2. If our Archer has an average Attack Level of 3, then it's a 3 to 2 attack, which means he has a 3 or better on a six-sided die to hit. That's about a 66% chance of success. So it would take on average 3.5, let's say 4, melees to take the guy down by an archer. So that's four bow shots and he's down. I think I have the math right, though I'm going by thumb towards the end here (it's late). Anyway, I can extrapolate from there in terms of the 3d6 Long Bow. There's a bit more nuance in there if you look carefully, but I'm off to bed. I still have to wake up early. I just thought this interesting enough to jot down so I can come back to it later and make a final decision on it. What do you think? 1d6 all around? Or beef em up as they go up in lbs? Bannister Nicholas posted some interesting thoughts on the topic of Does Story Trump Rules?... it's a messy subject because there's a huge amount of room for debate, and the terms are not really definitive, and there's a great deal of emotion vested in this topic by many players of RPGs. So, that said... here I go. Diving into the mess head first. I got to thinking about this never-ending debate between RPG Gamists and RPG Storyists. Which takes precedence over the other? Story or Rules? Usually the answer is related to what people on either side of the debate claim is more "fun". Some think story is more fun (as long as the story goes the way they feel is fun ... some stories are actually not fun, though they are definitely stories. For example, as Bannister points out, Romeo and Juliet is a classic tragedy). 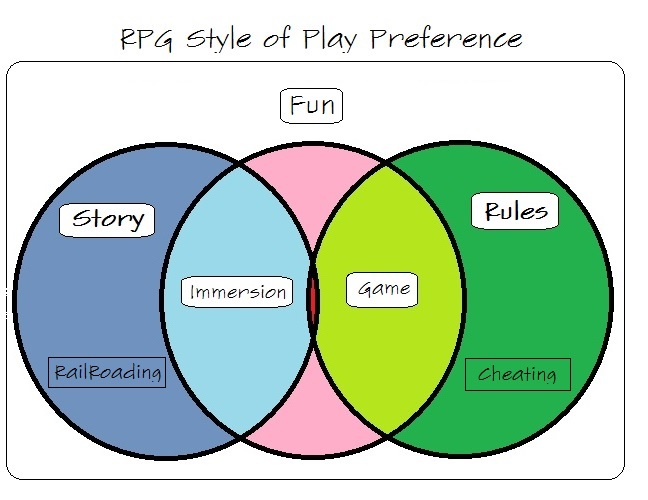 Other people feel that playing RPGs as a game is more fun. Of course one might immediately notice that "fun" is completely subjective. For some people playing an RPG as a game is the most fun. For other people playing an RPG as a story is the most fun. Usually the debate turns into a burning pile of turds when either side claims that what they think is fun is the only true fun, and what the other people think is fun, to borrow a nasty turn of the phrase from yesteryear, is BadWrongFun. This claim that one group's fun is wrong is at the heart of the entire controversy. I've written about this in the past and don't care to regurgitate my position endlessly on this, and it's all old history by now anyway, so I'd like to move along to what occurs to me about all of this. 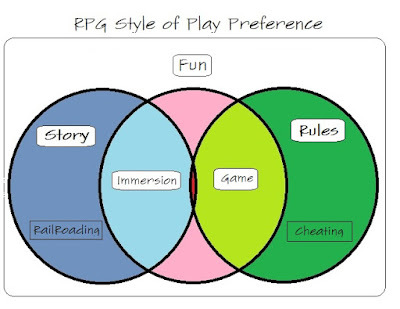 So there's two orientations for RPG Players (more, actually, but let's keep it simple for this discussion). There's Story Orientation and Rules Orientation. Sometimes people want to orient their game towards Story, sometimes they want to orient towards Rules. For those who prefer Story-Orientation, the objective is often stated to be Immersion. And since Immersion is fun, Story wins for them. In the other case of Rules Orientation, the objective is to play a Game, and for those people this is fun. What seems to be the case, and what makes this so messy and un-resolvable, is that RPGs appear to straddle this strange realm between these two incompatible worlds of desire. What makes it so difficult to resolve is that most players seem to want both from their RPGs, but in differing degrees based probably on something as whimsical as their mood of the moment while they're playing. In one turn strict adherence to the rules seems perfectly justified to them, while in the next a fudged die roll so that the plot does not get derailed by an errant bit of bad luck feels just as justified. It's kind of schizophrenic, actually. But I do see it quite often among most of the players I know. It's odd, but there you have it. What is almost impossible, I think, is to actually balance the two objectives. This is because, I think, in the case of Rules it's a binary proposition. You are either following the rules, or you're cheating, and in games cheating is not allowed. But for Story Oriented players cheating seems ok so long as the story is interesting, or meaningful, or at least fun, and it doesn't happen constantly. There are risks with both styles. For story oriented players the risk is that the GM will railroad the game in order to create a "fun" story. Usually this means, in most cases I've encountered, that the Players win. They save the princess, get the loot, kill the monsters, or what have you. However, the problem is that this takes away their agency as players and that ruins their fun because it eliminates challenge in the game. On the other side for Rules gamers there is a risk the GM will secretly or overtly cheat (or make mistakes), or the players will cheat (or behave like munchkins), which ruins their fun because cheating is Not-Fun. What is really at issue here, I think, is that from the days of yore, RPGs have attempted to fuse into one game, two completely different and incompatible objectives. Making a game both Story oriented and Rules oriented at the same time is, well... seemingly impossible. The problem is that this goes back to the very foundations upon which RPGs are built, and has its roots in the difference of style between Gygax and Arneson, if I have the history right. Gygax was a Rules oriented player, stemming out of his love of Wargames, as is reflected in the development of the miniatures game Chainmail, which became the original Dungeons & Dragons. On the other hand Arneson, whose focus was on Story, came out with an alternate view of the game, of which Blackmoor is a quite wonderful representation, that focused more on the story aspect. So the schizophrenia of RPGs was born at the dawn of the hobby, it seems. Since then the game has twisted into a rather complicated braid of Rules and Story with a zillion variations on the mix. And since the struggle between the two orientations has been going on since the dawn of the hobby, and will probably continue to be debated for a long time to come, I don't think it is likely there will be answer to the question "Which is better?" any time soon. This is probably ultimately because one's play preference totally subjective. All I ask is that people not claim that their own preference is the "One True Way", because neither preference is better than the other. And in most games, there is a fusion of both aspects. One of the principal roles of the GM is to balance the two during the course of each game. Sometimes the Story gains the upper hand, and the GM adjudicates things along Story lines, maybe fudging a die roll, or placing a monster somewhere other than directly behind the next turn of the corridor. Sometimes the Game predominates the GM focuses on the rules, battle map tactics, and the exact factors involved to accurately derive the necessary die rolls needed for success. I see GMs swinging back and forth between the two all the time. I know I do. Because frankly, I like both aspects and I think both are necessary for me to have a truly enjoyable game. But dang... it really is a difficult thing to balance well! It takes the right feel for the thing. And I don't think you can teach that easily at all. It just comes from experience... or intuition. So for those GMs who may be new to this debate, and who are hearing both sides tugging at their sleeves with "Do it my way! ", I just want to mention, there's a difficult but rewarding middle way. You can see it as the small red region on the diagram above. My experience tells me that this is the target to shoot for when GMing, as difficult as it may be to hit. Good luck, and happy gaming to you! "... Fu Manchu stories combine demonization of Eastern culture and denigration of effete intellectualism with high adventure and gripping suspense. The emphasis is on fast-paced action set in exotic locations, evocatively described in luxuriant detail, with countless thrills occurring to the unrelenting ticking of a tightly-wound clock. Strong romantic elements and sensuality described, sexually attractive women appear throughout the tales, but ultimately it is the fantastic nature of the adventures that appeal." Now it seems to me that any Gamemsaster worth their salt is going to do well at most of these things, should they happen to want to replicate the kinds of adventures found in "The Mystery of Fu Manchu" (and who wouldn't?). High Adventure and gripping suspense? Yup, we got that down. Fast-paced action set in exotic locations, evocatively described in luxuriant detail? Can do! Countless thrills? Yup! No problem! However, there is one sticking point. And it's an important one. It's that bit about "countless thrills occurring to the unrelenting ticking of a tightly-wound clock". Here's where the RPG as a modality grinds up against the imperatives of Pulp Fiction. The fact is, with a novel the author controls the characters, and so at that final crux moment when all seems lost, and the hero figures out some fabulous solution to the peril and thwarts the diabolical plan, and it all makes perfect sense and is thrilling and awesome - it can happen just like that. That's possible achieve because he author knows the villain's entire plan, and can sit and think for hours, days even, about how the characters will respond in just the right way, at the exact right time in order to elicit the greatest suspense for the reader, and final cathartic victory of the heroes. It's wonderful, and we readers joy in the thrill of the chase and the final culmination of Aha! at the end when the hero wins the day. We poor Gamesmasters, however, do not have this luxury at all. Not by a billion miles. First, we have no time to think whatsoever. Once the ball is rolling it is our job, of course, to keep it rolling as fast and furiously as possible. Two, the players control the characters, our heros, not the Gamesmaster/author. Three, the players are (usually) the audience and protagonists at the same time, which creates perplexing conditions in relation to our objective. 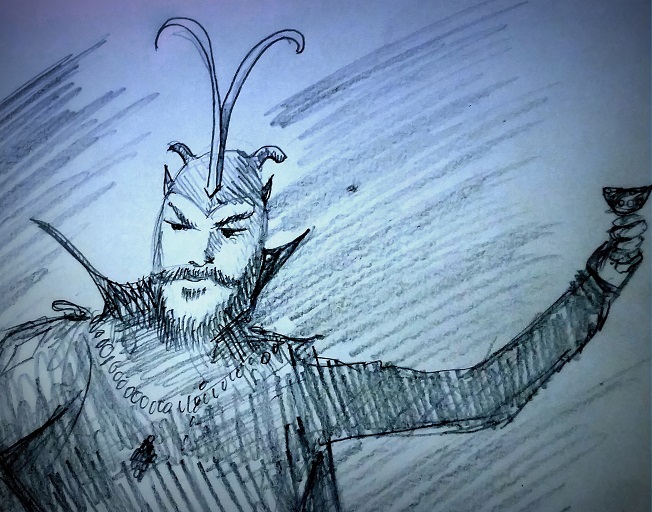 And lastly, the player is rarely if ever privy to the knowledge of the machinations of the antagonist, nor can they be, as that would ruin the fun of the thing for them as players. The result? Well, I won't say "disaster", exactly, but let's just say - this is very hard to pull off in a traditional style RPG. The thing is, in order to create suspense for the audience (in this case the Players) we can not divulge the villain's secret machinations to them until the absolute last second, if at all. It's up to the players to puzzle things out and come up with the right answer. That's the fun of the game, after all. And so the result is that the players having to make split second decisions with incomplete understanding, are more often likely to fail than succeed - just as the heroes in the novel are - except for them the author does a splendid job saving them with their great and just-in-time wit and wondrous luck - something we Gamesmasters aren't in a position to do without breaking the rules of the game! 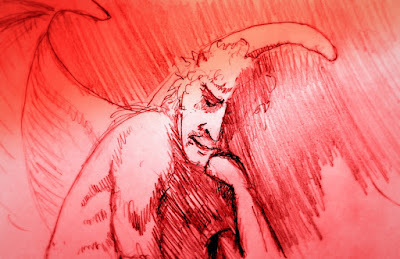 Really, if the machinations are properly planned by the antagonist then the solution is not likely to be dead obvious. And this of course leaves plenty of room for the player to make the wrong decision. In fact, it should be likely for the player to make the wrong decision, unless we have our master-mind antagonists be actual imbeciles. Fu Manchu, it should be said, is not an imbecile. Rather our heroes were either incredibly brilliant at the right moment (half the time), or incredibly lucky (half the time). But can our players be expected to have to be both, consistently? After all, every 50/50 chance taken via the roll of the dice decreases the overall odds of survival dramatically! It becomes, I'm afraid to say, a preposterous proposition for our players. If we created the scenario with integrity (meaning the antagonist plots things out as they ought to) then the player characters are very, very unlikely to actually survive the game. Not because the Characters themselves are not as resourceful and lucky as Nayland Smith, but because the dice and the lack of Player knowledge make it nigh on impossible. Too many split-second decisions must be made with brilliant deductions, nuanced thought, pin-point accurate recollections, and against too many live-or-die dice rolls to make the odds of success more than infinitesimal in a real game. In a novel, everything just happens with wondrous synchronicity because the author makes it so. In an RPG nothing of the sort can happen. We rely on the player's wit, and their luck, to see how things turn out. It is a very different animal. So the kind of game that is required in order to create the same atmosphere and suspense as a Fu Manchu novel is not very well embodied by the traditional style RPG, I'm afraid. And so I think it is fair and interesting to ask, how would one design an RPG so that the effect, the suspense and thrill, can be obtained? I think there are probably dozens of answers to this in the great wide world of Indie RPGs... however, can one devise a way to do so without the loss of the core mechanic of players rolling dice, and experiencing the same mystery, awe and fear as the characters in Sax Rohmer's novels? In other words, I put this puzzler out there for my Old School friends - how would you as a Gamesmaster, or player, solve this problem with a traditional style RPG? All answers, thoughts, and angst-ridden soliloquies are welcome! Please visit http://elthos.com to join the Free Open Beta of the Mythos Machine! (don't worry folks, as it happens my players never check my blog - it's ok ... shhh ... it allows me to post out here for you guys while we play). hee. Later they'll be like "omg". shhhh. The ancient and accursed township of Whitewode holds from time to time one or the other of these twin masters of evil. "Discovering how magic systems work can be the most geek-worthy part of reading fantasy stories. Do you enjoy one detailed magic system, or many interlocking ones? Let's spark some awesome! Share your favorite magic system moments!" While I have yet to work out exactly how I wish to implement this in my World via The Mythos Machine (http://elthos.com) I do plan to do so sometime within the next ... oh ... eon or so. Hopefully. At any rate, that's the style I would like my system to embody for at least one of my Worlds. The hard part is divorcing from the standard, which is this kind of awful focus on Weaponized Spells, such as Fire Ball and Lightning Bolt. Really overt Kill-Magic. 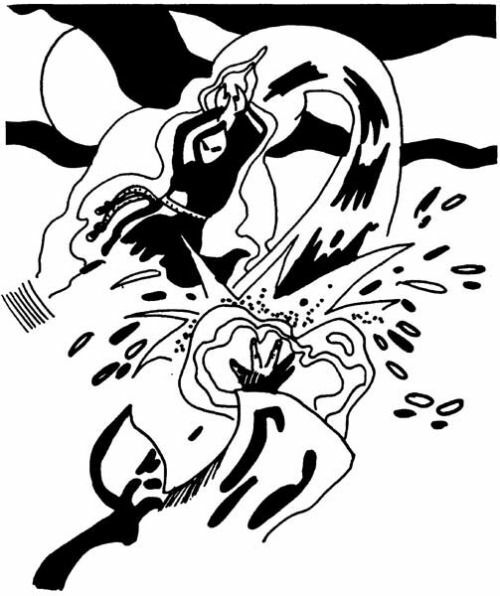 Nothing could be less magical, in my mind, than a "Magic User" standing there and casting a Fire Ball from his fingers. Magic should be cloaked, mysterious, unfathomable, even while adhering to it's own occult laws. How to get there from here is my challenge. I accept. Just don't expect me to work it out quickly. I don't do anything quickly, it seems. Ah well... I must learn to accept this and keep plodding. Maybe my totem animal is the tortoise. Of course one of the biggest problems with implementing Tolkienian Magic is that Wizards are extremely rare, and are in fact celestial avatars named Istari, and manifest in the world for the specific purpose of fulfilling Illuvitar's Almighty Vision. There are only five of them in Arda. So ... that kind of puts a damper on the whole "I wanna play a magic user!" kind of thing, if I develop my system based on Tolkien's vision of Magic. 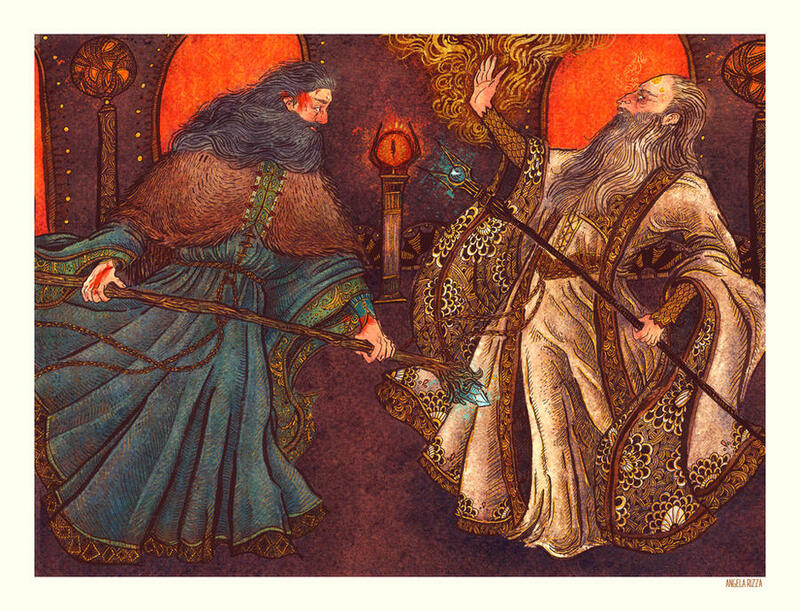 For Tolkien's Arda it makes perfect sense, and goes a long way to making magic balance in his world. The problem with the standard RPG model is that were a world like that to actually exist, it would very likely get torn apart by competing magical forces and factions, and would rapidly devolve into chaos and insanity. Read OD&D's magic list and think. What would our world be like if during the medieval era something like 20% of people had access to this list of spells? And magic items? In my mind I see a world of fire and ice, and endless intrigues and destruction untold. My guess is that if you toss in mythical monsters, and powerful evil forces... yeah... I kind of think we'd not have a world for long. It would be overrun by monsters, and the last straw to seal the deal would be human pride, greed and lust of power. So as I see it, magic as D&D posits it is only workable because GMs curtail what the evil forces of the world would actually do with it. Otherwise, we'd not have a game for very long. And that's the only reason magic of this sort works in RPGs. So the first thing to tackle would be to figure out how to have a world of very rare magic, and very rare magic users, and not unbalance the game to the point where the players feel like they can't have all the fun they want. After all, at least 20% of my players want to play Magic Users.